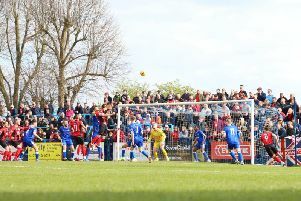 Scott Machin was delighted to see Kettering Town handle the pressure that was on them as they moved back to the top of the Evo-Stik Southern League Division One Central. After 24 days without a game, the Poppies returned to action at a freezing Latimer Park and claimed a 2-1 success over Beaconsfield SYCOB. The victory, which came thanks to goals from Andy Hall and Dubi Ogbonna, was enough to take Kettering back to the summit on goal difference after previous leaders Bedworth United’s game at Bedford Town fell victim to the weather. The Poppies still have games in hand on their rivals at the top and Machin is now keen for his side to produce some consistent performances, starting at Potters Bar Town on Saturday. “There was a lot of pressure on us because if we didn’t win the game then we would have been trailing with only two games in hand as opposed to three,” the joint-manager said. “Winning the game means we are back on top and we still have two more games than everyone else to play to get the points, although I would rather have them on board already. “But we did what we needed to do but now we have to be consistent with our play and do the same thing on Saturday. “It was great to get a game on finally and, on the whole, I thought we controlled the game pretty well. We looked a bit leggy in the last 20 minutes but that was understandable because we hadn’t played for nearly four weeks. “Apart from that, we were pleased. The goal for them just before half-time was a tough one to take because their lad probably won’t hit a shot like that again in his life. “But the message at half-time was to go out there and be positive. Their goal knocked the stuffing out of us but we wanted to be positive in the second half and it doesn’t get any better than scoring that quickly. “We put them under pressure for a good 15 minutes after we got the second but for the last half-an-hour the game slowed down and we played into their hands a little bit. I felt we took our foot off the gas too early.